WCS operates on the principle that reducing erosion, improving soil health, and improving farm profitability should be simple and sustainable. To this end we have developed several cover crop seed mixes to be utilized in any crop rotation or soil type. We will also do custom mixing for more advanced cover crop users. Don't make your cover crop choice a difficult situation. If you are new to cover crops or no-till, keep it simple. Use single species or simple blends to test them in a field and learn how to manage them. If you have wheat or other small grain in your rotation you have more options and opportunity to improve soil health. The limitation of using cover crops with Corn and Beans is the late harvest date. The best cover crop options may include using aerial seeding to apply the seeds in standing crops from late August to mid September. Cover crop rotations going to corn should be a majority nitrogen fixing type, or legume, with little grass or small grain. This combination provides early Nitrogen availability from the nodules of the legume plants, and later season Nitrogen from the decaying plant matter. Cover crop rotations going to beans should not contain any legume, and should be grass or small grain, with a brassica, if timing is appropriate. The use of cover crops in farming operations improves the soil health, increases organic matter in the soil, reduces the need for chemical fertilizers, can reduce the use of chemical herbicides and pesticides, reduces fuel consumption, and uses less time in the field compared to conventional tillage or no-till without cover crops. These benefits make the use of cover crops sustainable in farming operations. The reduced time in the field and reduced operating costs allow for more time managing the farm and spending time with friends and family. The Scavenger Mix is a combination of Cereal Grain and Radish. This is a proven combination that is economical and easily managed in the spring. Our stock mix is a combination of Cereal Rye and Radish. This is especially useful aerially seeded into standing corn or planted with a drill after harvest in rotation to soybeans. Plant by mid September to give radish time for best development. The cereal rye can be substituted with Oats, Annual Ryegrass, Triticale or Barley depending on cover crop goals and the timing of planting. For plantings after mid September, consider substituting rapeseed, as it is more likely to establish and overwinter for spring growth. The addition of Ethiopian Cabbage and Phacelia improve diversity and add the cabbage tap root and pollinator friendly phacelia flowers. Our stock mix contains Cereal Rye due to its winter hardiness and ability to terminate with mechanical or chemical means. Plant by Mid-September to give radish, cabbage and phacelia time for best development. This mix can also tolerate later plantings with additional growth in the spring of the cabbage and phacelia in a mild winter. Other cereal grains may be substituted depending on cover crop goals. The Super Scavenger Mix is an excellent choice for Prevent Plant acres or pipeline renovation ground. The high biomass from this mix will provide the opportunity for nutrient scavenging, soil building and weed control. This mix is also a good choice for grazing. The addition or substitution of a sorghum sudangrass would add to the grazing potential and carbon building. Plant by the end of August for the best performance of this mix. The WCS Nitro Mix is a combination of legume with radish or cereal grain. We recommend Crimson Clover with Radish, Hairy Vetch and Cereal Rye, or Winter Peas and Radish, depending on the cover crop goals. Plant until early October to ensure good establishment of the legume. These are not a stock item, due to their simplicity are mixed to order. This is not a stock mix, and will be mixed to order. The WCS Nitro Plus Mix is a three specie combination of legume with cereal grain and radish. We recommend Annual Ryegrass, Crimson Clover and Radish or Cereal Rye, Hairy Vetch and Radish. Any combination of cereal grain, legume and radish can be made based on the cover crop goals. Plant until early October to ensure establishment of the legume. This is not a stock mix, and will be mixed to order. This 10 way mix is designed for severely degraded soils to rapidly improve soil health and reduce Nitrogen inputs. The highly diverse mix provides a favorable environment for soil microorganisms, improving nutrient cycling, soil aggregation, water infiltration and reducing compaction. Use in rotations of small grains to corn/milo to get the greatest benefit. If planted in August it can be used as winter forage for even more benefit. Plant after small grain harvest or early spring depending on crop rotation, no later than August 31. Our stock mix uses oats due to their quick growth and ability to out compete late season weeds. This mix is one of the most popular due to its quick growth and weed suppression. With all winter kill species in the mix spring management is easy. This mix can provide excellent early winter grazing. The Soil Builder Plus Mix is intended to be planted after small grain harvest or aerially seeded into standing crops. 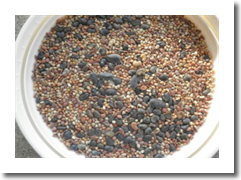 This mix has cold hardy varieties, but for seeding after mid September we recommend replacing the radish with rapeseed. Spring weed suppression is excellent, and there can be significant top growth if left to grow to maturity. Cereal Rye is the grain used in our standard mix due to planting flexibility and economics. This 9 way mix is designed for severely degraded soils to rapidly improve soil health and reduce Nitrogen inputs. The highly diverse mix provides a favorable environment for soil microorganisms, improving nutrient cycling, soil aggregation, water infiltration and reducing compaction. Use in rotations of small grains to corn to get the greatest benefit. It can be used as winter forage for even more benefit.